GL Communications Inc., offers you the world's leading Linux bridges and routers, WAN cards, and switches for mid-range network applications. GL has achieved industry leading price and performance for high-density T1/E1, DS3/E3, OC3/STM1 and OC12/STM4 bridging and routing. We are also a leading OEM supplier of bridge/router systems, communications cards, and Linux software for networking, telephony, satellite, and military applications. 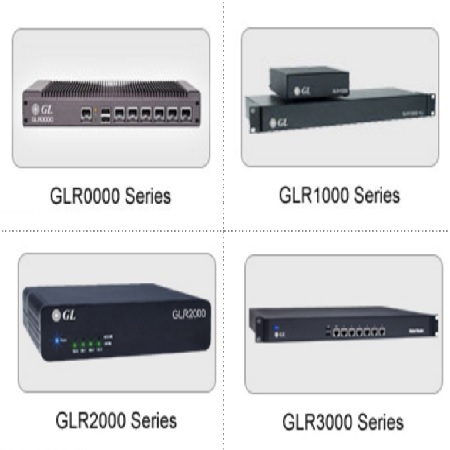 GL's industrial series include GLR1000, GLR2000, and GLR3000 WAN bridges and routers. Industrial Series bridges/routers provide industry leading price and performance using GL's Linux bridge/router distribution, off-the-shelf components, and mass-produced enclosures. GL’s WAN bridges/routers include standard features such as reliable flash storage, high-performance processors, and commodity memory. Entry-level systems provide a 1 Gbps backplane (32-bit 33 MHz PCI and/or MiniPCI), while high-end routers offer multiple PCI-X and PCI Express buses, hot-swap redundant power supplies, and DC power options. Our bridges/routers include the GL Linux™ router software distribution which relies on the Inetics™ platform. Inetics provides a powerful driver component architecture and additional software features that support a wide range of networking applications.